How to Achieve Balance In Your Stamping Business AND Between Your Business and Your Personal Life! One of the biggest challenges stamping business owners face is how to achieve balance in their professional and personal lives. If you’re having trouble balancing all of your professional and personal obligations. If you’re feeling like your family gets ignored when you focus on your business, or vice-versa, this CD can help. When family comes first... and when they may not! After listening to the CD, you'll have the information you need to establish a more balanced business, and, by extension, a more balanced life! One thing most stamping business owners have in common is that they all work too hard for their money. Fortunately (or unfortunately), this is usually their own fault. Stamping business owners consistently undervalue themselves and what they do. This CD addresses the problem and offers solutions! After listening to this CD, you'll have the information and the motivation to begin charging what you're worth and making the profit you deserve! This CD provides you with everything you need to know about how to effectively engage in Hostess Coaching. Putting the ideas on this CD into practice will maximize the number of people attending your workshops and gathering, as well as increasing your sales AND profit! When you're done listening to this CD, you'll have several new ideas and strategies to incorporate into your business to make your workshops and gatherings more effective and profitable! This CD is a recording of our most recent free teleconference call for stamping business owners. On this CD, we look at how to set up and market your website using a blog! When you're done listening to this CD, you'll have a complete overview with all of the information you need to set up and market your blog! This CD is a recording of the very popular teleconference call we did for stamping business owners. 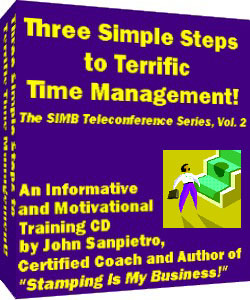 On this CD, we tackle the issue of time management! …AND the entire Q&A Session at the end of the call! When you're done listening to this CD, you'll have step-by-step guide to being more efficient, productive and profitable in less time than ever before! 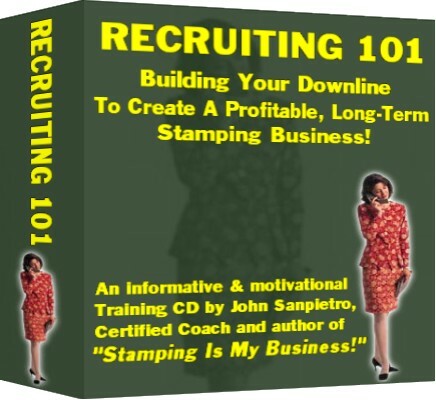 This CD is a recording of the first in a series of free teleconference calls for stamping business owners. Over 1000 stamping business owners participated in this call! 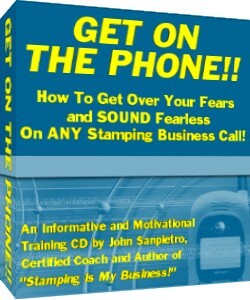 How to Get Over Your Fears and SOUND Fearless On ANY Stamping Business Call! Are you afraid of picking up the phone and calling customers, potential recruits or downline? Are you unsure about what to say in certain situations? This CD will address your fears, provide you with solid steps to overcome them AND take you through many of the most common phone call situations. We'll cover what to say and how to say it. When you're done listening to this CD, you'll be ready to GET ON THE PHONE!! 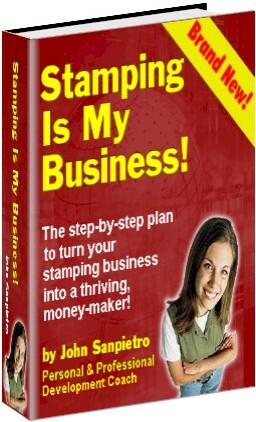 Building Your Downline To Create A Profitable, Long-Term Stamping Business! It's no secret that the key to any long-term, sustainable stamping business is recruiting. Yet, only 20% of all stamping business owners recruit even one downline! This CD...the studio version of the recruiting half of my Advanced Marketing & Recruiting Seminar...will teach you just about everything you need to know about recruiting, and help give you the confidence you need to make it happen! The word 'No' - You don't have to be afraid of it. Fear of being pushy - I'll show you a process of recruiting that nobody, including you, would ever think was pushy. Selling vs. Sharing - Gaining perspective on what you do. The 3-Step Recruiting Process - I'll take you through the process step-by-step, and show you everything you need to know about recruiting. The Five Responses - these are the five answers your prospect will give during each step of the process. I'll show you how to answer each one. The Five Objections - these are the five fears your prospect has that prevents them from signing up. Answering the Objections - I'll share a formula which will allow you to overcome ANY objection your prospect has. What Are YOU Afraid Of!? 20 Fears Concerns and Objections You May Have About Starting and Running Your Stamping Business...and Why You Shouldn't Let Then Stop You! This CD covers The Big 20: The most common fears people have when it comes to deciding whether or not to make stamping their business. This list is based on my coaching work with hundreds of stamping professionals. These 20 excuses are the ones you've most likely thought of yourself, or are most likely to encounter when trying to recruit downlines. On the CD, I go through each of these fears, one at a time, and provide the information and motivation you need to help you, or your prospects, get over them! My spouse/family doesn't support me. I work too much already. Why would I want to add more work? This is audio version of 'Stamping Is My Business!' Many of you have said you would prefer this over, or in addition to, the electronic or printed versions. Purchase more than one CD and save! Order All Nine - Balance, Practical Pricing for Profit, Hostess Coaching, Blogging, Time Management, How To Sell $400/month, Get On The Phone! !, Recruiting 101 AND What Are You Afraid Of!? Pick Eight - Balance, Practical Pricing for Profit, Hostess Coaching, Blogging, Time Management, How To Sell $400/month, Get On The Phone! !, Recruiting 101 OR What Are You Afraid Of!? Pick Seven - Balance, Practical Pricing for Profit, Hostess Coaching, Blogging, Time Management, How To Sell $400/month, Get On The Phone! !, Recruiting 101 OR What Are You Afraid Of!? Pick Six - Balance, Practical Pricing for Profit, Hostess Coaching, Blogging, Time Management, How To Sell $400/month, Get On The Phone! !, Recruiting 101 OR What Are You Afraid Of!? Pick Five - Balance, Practical Pricing for Profit, Hostess Coaching, Blogging, Time Management, How To Sell $400/month, Get On The Phone! !, Recruiting 101 OR What Are You Afraid Of!? Pick Four - Balance, Practical Pricing for Profit, Hostess Coaching, Blogging, Time Management, How To Sell $400/month, Get On The Phone! !, Recruiting 101 OR What Are You Afraid Of!? Pick Three - Balance, Practical Pricing for Profit, Hostess Coaching, Blogging, Time Management, How To Sell $400/month, Get On The Phone! !, Recruiting 101 OR What Are You Afraid Of!? Pick Two - Balance, Practical Pricing for Profit, Hostess Coaching, Blogging, Time Management, How To Sell $400/month, Get On The Phone! !, Recruiting 101 OR What Are You Afraid Of!? 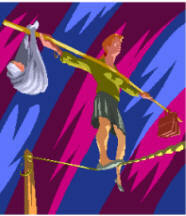 LEGAL STUFF: ©2003-2007, RELIEVE AND ACHIEVE COACHING. ALL RIGHTS RESERVED.